She had moved to the area only the year before, lured by the climate, the year-round greenery, and Victoria’s reputation as a city of flowers. Her new home included a garden, with one rocky section that saw little sun. Moss would thrive there, but she wanted something more dramatic. 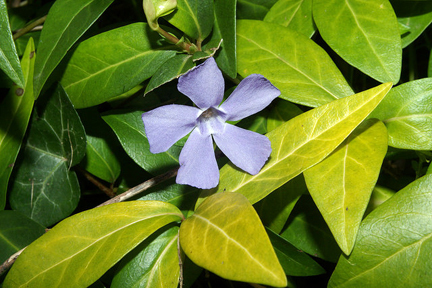 Online research identified a solution—common periwinkle, a blue-flowered, creeping vine that grows wild in many area gardens and parks. When she sent a call via an online forum—“Does anyone know where I can obtain live rootstock of the groundcover called common periwinkle?”—I jumped in. As the conversation unfolded, she admitted she’d tried buying the plant from the region’s garden stores, but they didn’t carry it and refused to order it in. She said they also advised her—strongly—to not plant it at all, and cited local standards regarding invasive plant species. But she was determined. She wanted periwinkle. And, if she wasn’t going to get it via official outlets, she would dig some up and transplant it to her garden. All she needed was a location. I imagine she got what she wanted. It wouldn’t have been difficult. And by now, I expect the plant has established and spread well beyond the rocky area she wanted groundcover for. I suspect she—and her unappreciative neighbours—have also experienced first hand how persistent and long-reaching the roots are, and how the plant (Latin genus name, Vinca, meaning—appropriately—to bind or fetter) takes over and is really, really difficult to control. Invasive species are one of the five most significant causes of biodiversity loss and change to key ecosystem function. They also increase maintenance costs to public parks and private property, and can significantly devalue real estate. In 2006, approximately $7 million was spent on invasive plant management activities in B.C. Without intervention, the costs of economic damage caused by invasive plants in the province is estimated to reach as much as $139 million by 2020—very possibly an underestimate, as economic data for all potential impacts are unavailable. Canada-wide, the cost of invasive species ranges from $16.6 billion and $34.5 billion per year, including both direct costs for control and eradication, and indirect costs to industries, the environment and communities. Now, with days noticeably lengthening and warming—and snowdrops and daffodils awakening—gardeners throughout the region are starting to plan for the coming growing season. Some may decide to plant attractive species that may be invasive. To help people avoid those choices, the Invasive Species Council of British Columbia provides accessible information on which plants are invasive. Its PlantWise supports the horticulture industry’s transition to becoming invasive-free, and builds consumer demand for non-invasive plants. A newly launched mobile app and website (www.beplantwise.ca) links to a database of recommended, non-invasive plants, sorted by the province’s growing zones. In addition, the council has been working with garden centres throughout the province to limit retail availability of problem plants. Almost 20 B.C. retailers, growers and landscapers have agreed to lead by example. They have committed to stop selling invasive plants and to promote responsible alternatives—as the person above discovered. The companies will no longer sell common periwinkle, nor Daphne laureola, English ivy, holly, purple loosestrife, butterfly bush, bachelor’s buttons, gorse, Himalayan blackberry, oxeye daisy, Scotch broom, nor any of the dozens of other invasive species listed on PlantWise site. Unfortunately, even with this roadblock, people determined to landscape with red-flagged species will still be able to source them from the wild or from less community-minded outlets. However, doing so will likely take more effort and increase likelihood of encounters with local experts who will advise them of safer alternatives. If even a few of those people actually listen, think, and take that advice, B.C. communities, industries and ecosystems will benefit. The Invasive Species Council of B.C. holds its annual public forum and general meeting this week, with intensive workshops for members of industry and the public scheduled before and after. A version of this editorial appears in the January 31 edition of the Victoria Times Colonist.